In the afternoon we met with Miguel Chitic of CONIC (National Coordination of Indigenous and Farmers), who discussed the land issues and the difficulties faced by Guatemalan farmers who are routinely exploited under the global market economy. 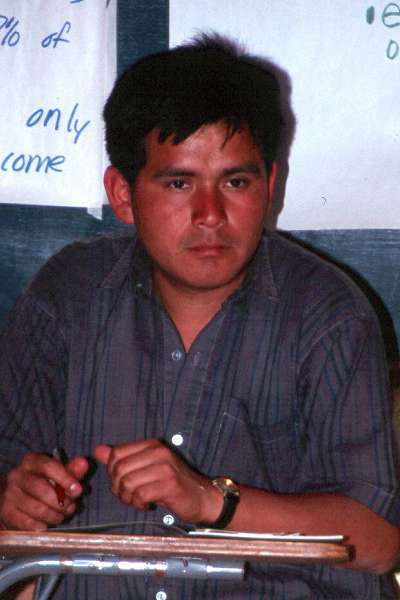 Miguel Chitic of CONIC (National Coordination of Indigenous and Farmers). Our mandate consists of political training of campesinos (peasant farmers) -- mostly about their rights -- provision of technical support through a sustainable agricultural commission, provision of information about various actions undertaken by CONIC, and provision of support to women through political training. CONIC is composed of both men and women. The participation of women is a pillar of the organization and a source of strength. Marginalization, misery and corruption have caused all the power to be kept in the hands of a few, and this is one of the main reasons for CONIC to exist. Recently, a community in the countryside was run off their land. The community asked the government for help, but when nothing happened, they decided to occupy the land. The government decided then to use force to run the people off. Only recently has the government decided to deal with the situation, and bought some land in the South Coast for about 500 of the families. Land has been at the center of the Guatemalan conflict, and it is one of the reasons for today's problems. According to some statistics, 74% of cultivated land is owned by 6% of the population, and the remaining 26% of land is owned by 94% of the population. It is very hard, or impossible, to live off land this way. Many people have very little or no land at all. Thanks to hard work, CONIC was able to receive about 300 caballerias (45 to 50 hectares to a caballeria). This land was not a gift, but the fruit of struggles and occupations that caused violent reprisal. Many farmers were killed or tortured because of it. Although it was really hard, the results have empowered CONIC. The Peace Accords ended the 36 year-conflict, but the proposed Accord on Socioeconomic Issues and the Agrarian Situation -- part of the Accords -- does not change much of the situation for farmers. It does not involve a true land reform. Still, campesinos were very hopeful because they felt that, although the government's effort was minimal, it was at least a first step. 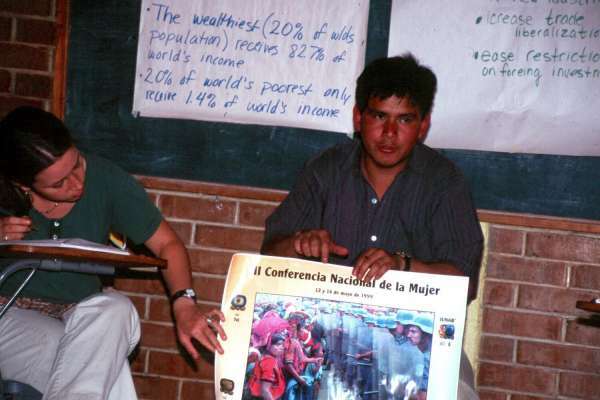 Julia examines a poster held by Miguel Chitic, commemorating a march by indigenous peoples and farmers struggling for human rights and just salaries. With the Accords, two institutions were created: CONTIERRA, a coordinating body to solve conflicts over land, and FONDO DE TIERRA, a coordinating body to buy and sell land. 200 communities from CONIC have appealed to these organizations for their intervention, but only 1 case was solved by CONTIERRA, and only 3 were solved by FONDO DE TIERRA. A long time has passed, and very little has been achieved through them. The whole idea behind these institutions is also wrong. They buy land for the campesinos, but then the campesinos have to pay them back for it, and they cannot afford it. These institutions seem to carry out neoliberal practices that CONIC does not agree with. For two years CONIC tried to give space to the government in order to solve these issues. We tried to have a commission formed to negotiate the agrarian problems, but nothing happened. So last year CONIC promoted a march for Mayans and campesinos to push the government to comply with what it had promised (more land for the people). The march lasted three days, and people were coming in and joining from the North, the East and the West. They walked for about 90 km, and they met in the city on October 12th, 1999. This showed that people from all over wanted changes and it showed also that CONIC has a very good level of organization. Many other marches took place, but with people only coming form one area, therefore limiting the effect. Redistribution of land, increase of wages, transparency of justice, real and true development and end of the repression of campesino leaders are the main struggles of campesinos and Mayans. In rural areas, in the fincas (plantations), the minimum wage of 20 Quetzales [about $2.50 USD] per day is rarely implemented, and education and health services cannot be easily accessed. As for the end of the repression of campesino leaders, there is now a law that allows landowners to persecute those that complain. That is simply unjust. A landowner can complain and persecute a worker, but if a worker complains, he gets 3 to 5 years in jail. CONIC is also asking for real and true development of communities. A lot of social services were supposed to be provided, but that has not happened. New schools were not built, new teachers were not hired, roads were not built, or if they were they do not reach the mountains. In short, even the few services that are present do not reach the neediest. CONIC is now planning another march, which we hope to be a massive, general march to pressure the new government to do what it promised. In July 2000, there will also be a conference for women, so that they can discuss and express their own needs. The FRG (Frente Republicano Guatemalteco/Republican Guatemalan Front) gained power during the last elections because of its "popular" appeal. In his speeches, the current president (Portillo), who went to many communities, proposed a lot of changes including the raising of wages, redistribution of land, etc. Now that he is president, the government is in debt to the people, and CONIC is going to hold them responsible for it. CONIC believes that Portillo's appeal for a mutual accord can happen. However, CONIC wants to participate only if some conditions are satisfied, not like in the previous accord where minimal changes were made. If those conditions are not satisfied, we will keep on fighting. Although everybody -- Guatemalans, international organizations and other bodies -- are waiting to see what will happen with the new government, it is important that people keep an eye on Guatemala to make sure what happened in the last decades will not happen again.